On 12th Jan, 2012, God blessed us with a sweet son. He is my first child; therefore I learned many new things about parenting. As a parent, your utmost priority is to take care of your child at any cost. You always try hard to provide him with all necessary comforts. During my One year and three month old experience, I daily learned about new things which are good for my child and many things which are not good for him. Today, I am sharing my experience with baby diapers. I bought first diapers on 13th Jan, 2013 just one day after the birth of my son; though, we did not use any diaper for first 30 days. My first purchase of diapers was for Pamper New born diapers (2 Pcs) pack. Later, I bought big pack of Huggies diapers in small size. For first three months, we used Huggies diapers only because I was only aware of this brand and in my knowledge, it was best brand available in market. However, somehow our experience with Huggies diapers was not good because leakage problem was very common with them so we shifted to pamper diapers. Our experience with Pampers Diapers were very good and there were no leakage problem with them. On one day, my wife watched advertisement of Mamy Poko Pants Style diapers in TV and she insisted that we should also try Mamy Poko Pants Style diapers. After her repeated request, I bought medium size Mamy Poko pant style diapers. To our surprise, it was one of our best decisions because baby was feeling comfortable in them, they were lasting for long time and, there was no leakage problem and it was very easy to wear them to baby and tear them apart at end. I started with M size Mamy Poko pant diapers and today, we are using XL size diapers. Now we do not use diaper so frequently and soon, we are planning to abandon use of diaper at all because my son is able to indicate about his motion movements in advance. If we compare price then Mamy Poko pants are slightly more expensive than other brands of diapers like Huggies and Pampers. However when we compare benefits then they outperform all. Today, Huggies and Pampers have also launched their pant style diapers. I have tried Huggies pant style diapers and I found them quite useful; however, there price is very high even expensive then Mamy Poko pant style diapers. Overall, I will like to give 9 out of 10 marks to Mamy Poko Style diapers for new innovation and great comfort they provide to babies and parents. If price is not matter to you, then they are good option for. 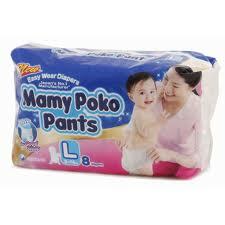 To compensate price, you can find 10 to 30% discount online for Mamy Poko Pants style diapers. In my local market, I was only able to get maximum of 5% discount and sometimes, there was not even 1% off was offered on diaper. But thanks to baby product sites like amazon.in, I got good discounts every time. Many times, these sites offer huge discounts on diaper. To learn about these offer, simply register with these sites and they will send you offers whenever they are live. Hi not sure where to start. I am blessed with an angel six months back. When it comes to choose diapers its very confusing. Pampers are good that's what I found last month. This month we bought mamy poko pants and not sure why its not absorbing the toilet we have to change the diapers twice or thrice in night. When we used it last time it was good. Can you suggest what might be wrong or should I choose different diapers.